JOY HIGH PERFORMANCE is just what the name says.  A High Performance food developed for High Performance dogs. 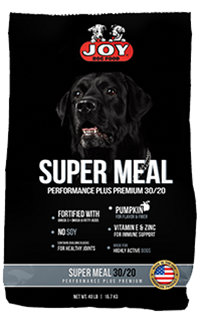 This 26% Protein, 18% Fat, meat-first, soy-free formula contains all of the nutrients your dog needs to achieve peak performance.  JOY ORIGINAL HIGH-ENERGY is a Premium Dog Food formulated to meet the nutritional needs of very active and hard working dogs. 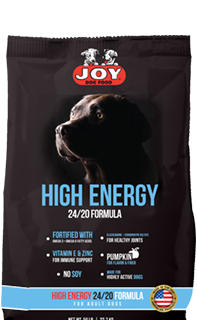 Canine athletes require an enriched nutritional formula to maintain endurance and endure the stress of competition.  JOY SUPER MEAL is formulated for hard-working dogs in a nutrient dense 30% Protein and 20% Fat diet. This complete and balanced food provides improved digestibility and increased energy.  JOY ADULT FORMULA 26/18 Premium Dog Food provides optimum nutrition for highly active dogs. This premium formula is complete and balanced using only the finest ingredients. 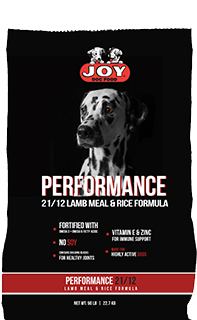 Joy Pet Food Lamb Meal & Rice Formula is a Super Premium Dog Food formulated without corn, wheat or soybean meal. 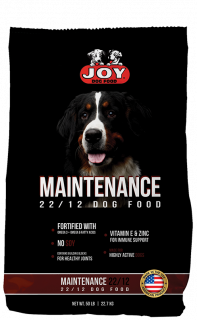 JOY MAINTENANCE PLUS is a highly palatable 22% Protein, 12% Fat, meat-based, soy-free, complete and balanced diet suitable for normally active adult dogs. 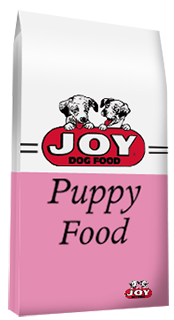 This food is formulated to meet all the nutritional needs of your growing puppy. This chicken based, soy free formula is specifically designed to provide the essential nutritional needs of a puppy while preventing gaining excess weight. 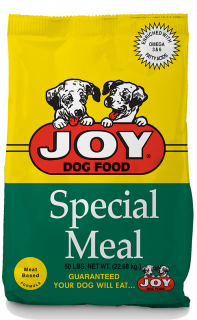 JOY SPECIAL MEAL has been one of the most recognized and trusted dog foods for more than 40 years. For generations dogs have thrived on this exceptional food. 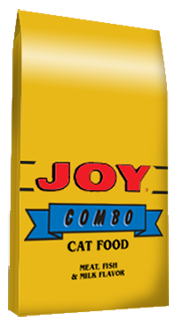 JOY Combo Cat Food is a complete and balanced diet for all cats. The star-shaped morsels are a rich and tasty blend of natural flavors, chicken and liver that cats prefer.